In conjunction with my post on cooking, here’s a simple yet delicious dish to make. It touches on a lot of basic cooking concepts that serve as a foundation to many meals: marinating, chopping, sautéing, grilling, seasoning, and plating. 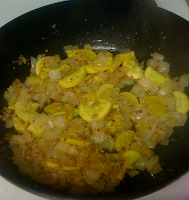 First I sautéed one sweet onion with one chopped summer squash, adding lots of garlic when the onions start to brown. I added spices including salt and black pepper, oregano, thyme, cayenne pepper (you can really add whatever you want here to get a taste that satisfies you). 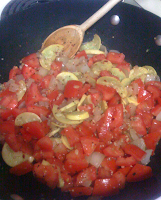 I then added fresh chopped vine tomatoes. When chopping, I usually remove the majority of innards & seeds as they bring too much acidity to the sauce. I like a thicker, chunkier consistency as the chunked tomatoes will cook down into a nice sauce texture and not make a soup on your plate. 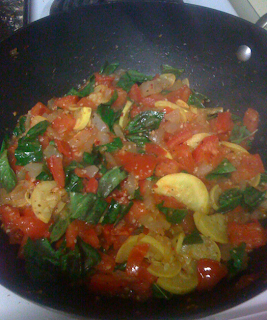 Then I added fresh chopped basil leaves and re-seasoned to taste. Cook on medium-low until it reaches a desired consistency. Such a great aroma. Meanwhile, I grilled up butchered-thin, center-cut boneless pork loin that had been marinating for an hour or so (in italian herbs & spices, hot pepper vinegar, oil, spoon of dijon). Grilled on high heat to get some good crispy edges. 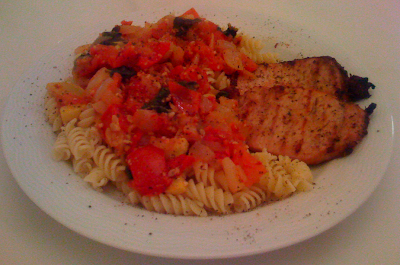 Finally, I plated the tomato/basil/onion/squash over rotini, with the pork on side. I add lots of parmigiano reggiano to top and garnish with ground black pepper and a basil leaf or two on top. Served best with some good old 2% milk or a glass of your favorite red wine.